Patrick Wensink's book "Broken Piano For President" has a familiar-looking cover. So familiar, in fact, that Jack Daniel's sent his publisher Lazy Facist Press a cease-and-desist letter, asking him to change it. This isn't the first time this has happened; David Thorne received such a letter from Penguin regarding his original cover for "I'll Go Home Then, It's Warm And Has Chairs"; Tito Ortiz's publisher received one from the Ultimate Fighting Championship for him wearing his champion's belt on the cover, an apparent breach of image rights, and according to the UPI wire service, a book cover in 1982 had to be changed because no less than the Secret Service sent a cease-and-desist regarding a photograph of the author's press pass. However, it seems unlikely that any of these letters were as civilized as that from JD's senior attorney for trademarks, Christy Susman. "We are certainly flattered by your affection for the brand," it states in a very unlawyerly manner, continuing "because you are both a Louisville "neighbor" and a fan of the brand, we simply request that you change the cover design when the book is re-printed. If you would be willing to change the design sooner than that... we would be willing to contribute a reasonable amount towards the costs of doing so." She signed off with "We wish you continued success with your writing." Say what you like about Jack's taste in whiskey, when it comes to supporting independent presses, he's clearly pretty smooth. The author told Jim Romenesko, "my publisher has decided to change the cover art." Concerning the original cover, the author wrote on his blog, "that baby's going to be a collector's item!" See the two labels below. 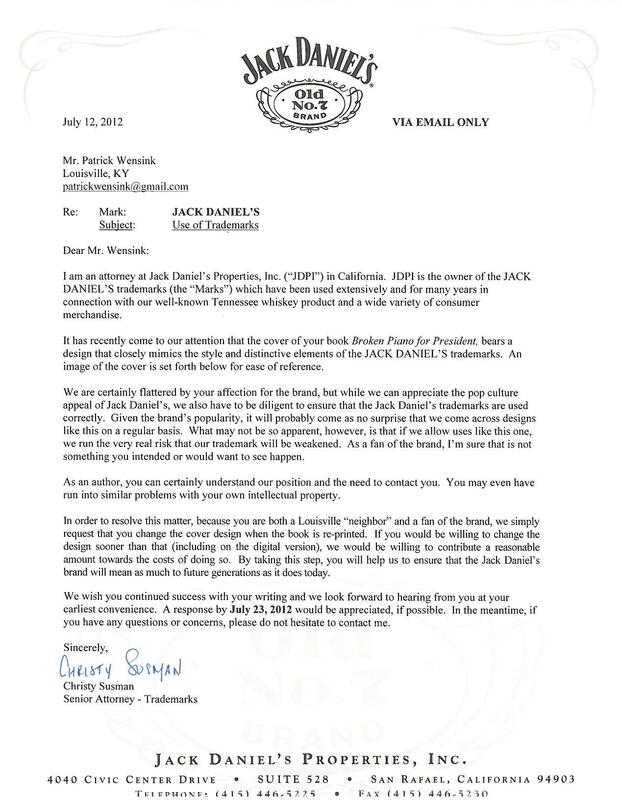 What do you think about how Jack Daniel's handled this?